Happy New Team Stryker Day everyone! I just got back from a five day road trip where I drove over 24 hours in five days and I’m exhausted! A great childhood friend of mine got married so Sabrina and I drove from Calgary, Alberta to Vancouver, BC for the wedding. Sadly I didn’t have any free time to work on Team Stryker, but these are the sacrifices I made as I get older and all my friends start getting married and having babies. My only goal for this page of Team Stryker was to get Casanova in a kimono and have his hair up in a towel and I feel like I succeeded in this regard. 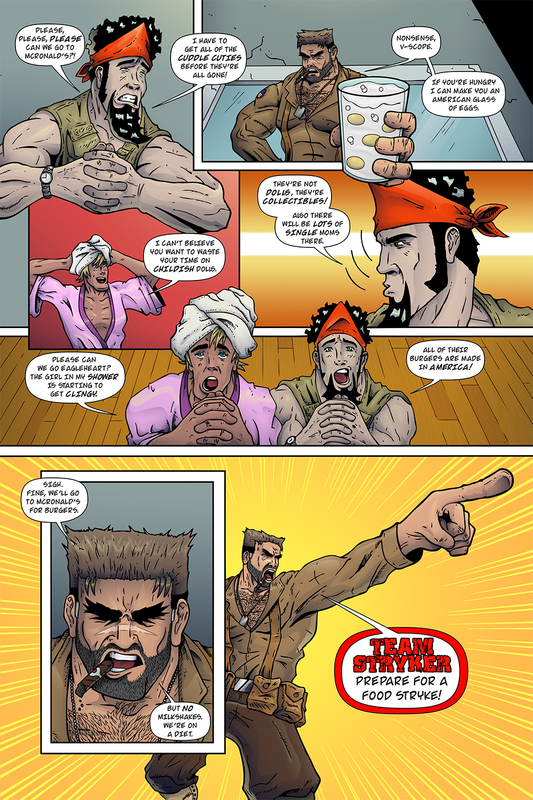 Since the early days of Team Stryker I always wanted to show off the inside of their base of operations and one day have Casanova in a bathrobe that would make Zapp Brannigan blush. Now that I’ve done both of these things I can die a happy man. Team Stryker will be back next week but check out Team Stryker on Facebook, Twitter and Patreon until then!